Well its finally complete,.. my VT has been engine treated, 6000 mi. ran in, and turbo treated, 6500 miles ran in. 7500 mi. can around, the "carrier" Motul which had served me well ( I'm a fan Cbrmale), was scheduled to come out and be replaced BY !!! TADAA !! 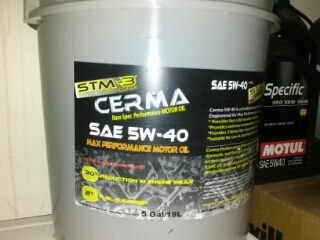 CERMA oil 5w40. - I could not scrape it off. -And its nature was extremely SLIPPERY to the touch with ones finger coated in oil. It was markedly more "slippery" than the portion of the dipstick which was uncoated. CERMA binds to wherever there is heat and or friction. CARBON CAN NEVER STICK TO A CERMA TREATED SURFACE. (YES,..our dirty GDI's,..no more build up). The oil makes carbon bind to itself rendering it salvageable in size for out filter media. The inventor of CERMA had explained to me that the CERMA engine treatment would treat the ferrous metal innards of the ENTIRE inside of the engine for its LIFE !! 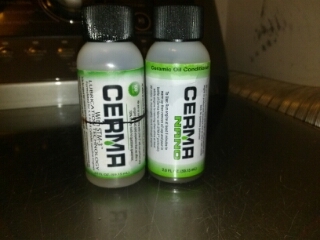 The NANO CERMA would treat the bushings of the turbo and any other non-ferrous components in the oil circulate. Now I had evidence in front of my face that I could relate to. 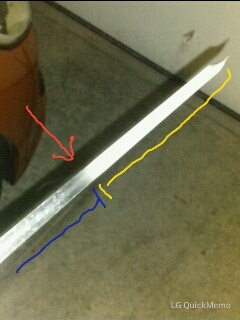 Notice the two zones on the dipstick, the yellow is coated, the blue is not. The engine treatment is on the left, the nano is on the right. NEW cars only use 1 oz. of each they require "dirty" oil to carry them. The run in period for each is a minimum of 1,000 miles. I did 1500, before I changed the oil over to CERMA oil. The oil, YES I bought a 5 gallon drum,...was 99.00. YES its a approved MINIMUM class 5 lubricant. The standard ratings don't do it justice. ITS OFF THE STANDARDIZED CHARTS. Willnot breakdown in any fashion to around 1100 degrees. -Increased compression,..yes a POWER mod in an oil change...BAM!! -Treated surfaces will "conduct and transfer heat more efficiently"
There are many YOUtube videos on all its properties. Product reps please don't hate,..THIS IS PROGRESS. I have no affiliation other than being an astounded customer. * Let car get to operating temperature (oil at 180 degrees F or higher). * Shut car off, open hood, remove engine cover. * Have the engine treatment bottle prepped and ready to pour. * Remove oil cap &amp; quickly pour 1 oz. of engine treatment into oil. * Quickly replace oil cap &amp; start car ASAP (within 10-20 seconds after pouring it in; run if you have to). * Fluctuate revs between 2000-3000 RPM for at least two minutes (I went for nearly five; it's ok if you go a little higher or lower). * Begin driving the car on local streets, hopefully where there are lots of lights or stop signs and not too much traffic. * Use engine braking to decelerate during this initial driving stage. * Leave the car in each gear longer than normal (say to 4500-5000 RPM) and gently accelerate (do not punch it, use engine braking). * After five minutes, start taking the car to 6000 RPM in each gear, still slowly accelerating (no hammering it, use engine braking). * After five minutes, start taking the car to 6500 RPM in each gear, accelerating moderately (still no hammering it, use engine braking). * After five minutes, do a few hard pulls to redline in 1st &amp; 2nd gear (hammer it as much as you like, engine braking optional). If you need to add more engine treatment, repeat the process until the driving portion, then just drive normally (since your engine is already treated). Wait until 1500 miles to do the nano/turbo treatment (I waited 2500); 500 IMO is too soon. * Keep revs between 1500-2000 RPM for at least two minutes; you can repeat the driving procedure or just drive as normal. Wait another 1500 miles to switch to CERMA or CERMAX 5W30 or 5W40. Last edited by vt_guest123; 02-11-2014 at 11:05 AM. vt_guest123, NDspd, msnow and 1 others like this. Sweet merciful crap.. This for real? Just think,..no need for a catch can ! Last edited by Gaijiin; 12-28-2013 at 09:42 PM. That dipstick looks like the inside of the engine that they bore scoped in the video. I treated my VT and will treat my wife's Santa Fe as well. For the cost of an oil change, I figured I got nothing to lose. So I just add this once and it's there forever? I need to get Cbrmale's input on this before I continue. swordfish, Thepuma84, NEVL666 and 1 others like this. He definitely is the oil dude,...but they don't have this in Aussieland. I think he could order some and check it out. Yes you only add the treatments once. The oil,...I plan on changing it every 4,000 regardless of the fact that it will look completely clean. so this is an oil that is f$%king awesome? sorry i am a little intoxicated help my understand in my drunkin state. Its like Irish car bombs for your VT.
do i have a new status? i dont like car bombs and my car they dont mix lol. all joking aside i am interested in this stuff. is it an oil i put in once or every time i change my oil? I have three loves in life, the wife, my CB7, and my VT in that order. If it's so wonderful, why doesn't my dealer recommend it? Or, why can't I find a zombie-like following at my local parts store? I'm a bit hesitant. Sure, it isn't doing any harm, but it sure reminds me of that ole Slick 50 my dad had sitting in the garage. It sat there because my dad never saw the true benefits of it in any of his vehicles. No harm, but no glorious benefits. Zapper, Mr.MattyV and Phantom Black 13 like this.